The majority of US voters think their government should be more aggressive about deporting illegal immigrants, dislike automatic citizenship, and oppose President Obama’s amnesty plan, a new survey shows. Fifty-one percent of respondents disagreed that illegal immigrants with American-born children should be exempt from deportation – as proposed by the president’s amnesty plan – while only 32 percent agreed. In November, those percentages were 42 and 38 respectively. Most of those polled, 54 percent, continue to oppose automatic birthright citizenship for children born to illegal immigrant mothers. Only 38 percent favor the current policy, which grants citizenship to all born on US soil. Since the first survey in April 2006, Rasmussen noted, support for automatic citizenship has ranged from 28 percent to 41 percent, and opposition has varied from 51 percent to 65 percent. Belief that a person should have to prove they are in the country legally before receiving government services remains steady at 83 percent. August 2014 surveys indicated 74 percent of likely voters also supported voter ID laws, and did not believe them discriminatory. Only 41 percent of the voters polled support Obama’s plan to allow almost 5 million illegal immigrants to stay in the US legally and apply for jobs, while 47 percent now think Congress should find a way to stop it. The survey was conducted on April 1-2, on a sample of 1,000 likely voters, with a margin of error of +/- 3 percentage points and a 95 percent level of confidence. A demographic and party affiliation breakdown of the respondents reveals that people under 40 are more favorable to birthright citizenship, but only slightly less enthusiastic about deporting illegal immigrants. Sixty percent of whites oppose automatic citizenship, while 51 percent of blacks and 56 percent of other minority voters were in favor. Only 40 percent of Democrats thought the government was not aggressive enough in deportations, and were far more concerned deportations might violate civil rights of some US citizens. The majority of Democrats (51 percent) also believe illegals with American-born children should be exempt from deportation. 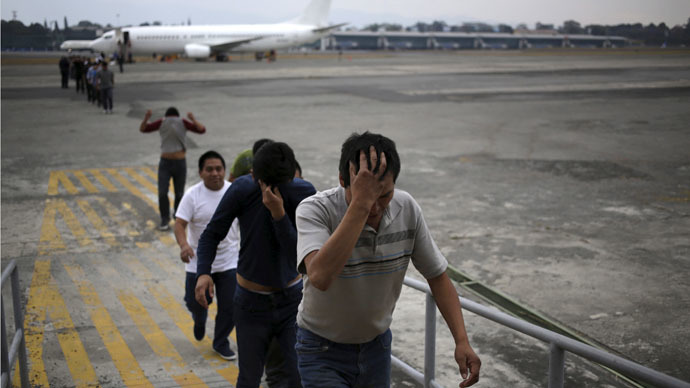 Meanwhile, among the Republicans and the unaffiliated, 81 percent and 68 percent respectively believed the government should get tougher on deportations, while 62 and 60 percent respectively opposed birthright citizenship.